Brand new Texas group The Vangoes describe their music as “feel-good hip-hop & soul,” which is an accurate description of their debut album A New Day. The Vangoes incorporate a vocal mixture of rap and melody along with real instruments that channel old school funk and Motown sounds. This group is a breath of fresh air in this genre because the lyrics are decidedly devoid of the needlessly prevalent negative themes and profanity associated with today’s mainstream rap and hip-hop. No need for multiple censored lines and phrases here. The lyrics contain positive and upbeat motifs, without sounding hokey or cliché. It is a relief to hear this genre explored with such an approach. In an era when many art forms feel the need to incorporate cursing and sexual innuendoes to appear hip or relevant, The Vangoes go in the other direction and prove that true artistry flourishes in the absence of such overused vulgarities and tired expletives. The formatting of A New Day is unique; the album begins with a sound-effect intro that mimics a jukebox and a needle hitting vinyl. This sets the tone for the vintage vibe of the production. We also hear some spoken word and other creative interludes throughout, making it a somewhat atypical recording – not a bad thing in the midst of today’s cookie-cutter productions. Highlights on the album include the catchy first track, “Hey, Hey,” which is reminiscent of Red Hot Chili Peppers with some added soul. The brass on this tune is dynamically arranged, and slap-back guitar tone gives a nod to ‘60s Stax session guitarist Steve Cropper. “Across the Room,” which also appears on the record in acoustic format, utilizes a musical mixture of soul and reggae. The Vangoes showcase their perfect balance of singing and rapping in this track, making it the most obvious contender for the Billboard singles charts if it gets into the right hands. “Serenade” is a soulful piano ballad that highlights the vocal chops of singer Lamar Jones, introduced on the record in a spoken word interlude by Vangoes rapper Shawn Elliot. “Speed of Light” is a slight departure into heavy rock, but it works. 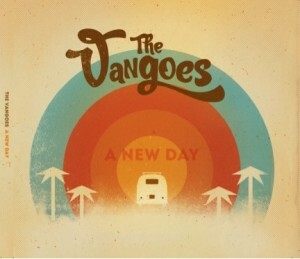 It appears The Vangoes can tackle pretty much any genre efficiently and creatively. With a talented duo of frontmen and a skillful cluster of musicians, this young and fresh outfit is more than prepared to take their music to the larger market with A New Day. The challenge will be weeding through the wannabes of this genre. Unlike most, The Vangoes actually have the goods; they now need to focus on getting themselves heard by the right people in the business. This album has alot potential and the music is so unique and awesome. It’s that feel good music that everyones been waiting for. Take a ride with The Vangoes.